A dear friend offered to host the annual family-friendly Halloween/Trick-or-Treating party (meaning, as much fun for adults as kids, including Kitchen Dance Party long after we all should have been asleep) . 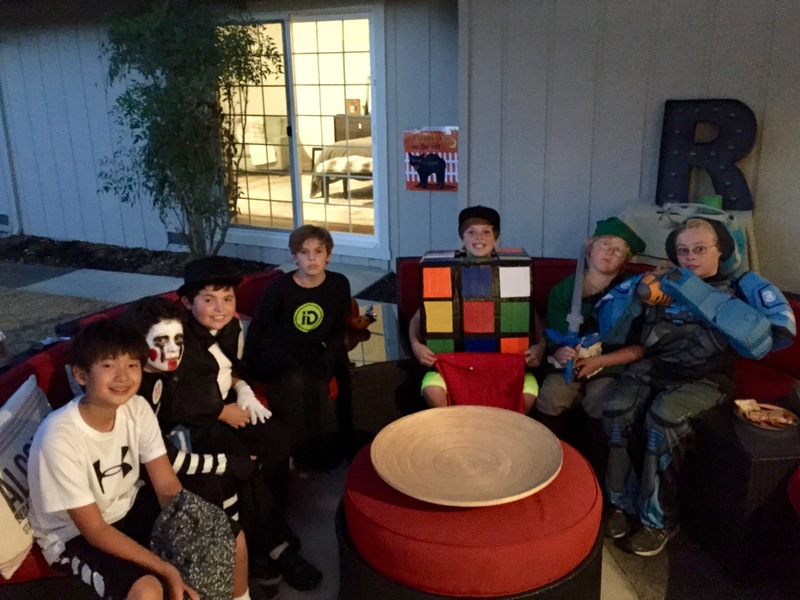 This Halloween dealt us a new parenting milestone – Teen definitely had his own plans and Tween, willing to attend party and eat food, felt desperate to Trick-or-Treat sans parental types. Let’s just say this was our first Halloween in eleven years that we did not attend an elementary school Costume Parade; we did not follow our Tween down the street; no Trick-or-Treating for us. Sniff, sniff. Anyway, Friend said she’d make both beef and veggie chilis. Knowing she had more than enough to do, I offered to make the veggie chili. Upon tasting it, another friend – stunned a pot of veggies could taste so scrumptious? – asked what in the world I did. And I can’t believe I haven’t shared Veggie Chili, one of my all-time fav comfort foods. Thing is, I kinda wing this one. It always has onion, garlic, beans, and tomatoes. It usually has zucchini, bell pepper, and corn. Because I had some, I added mushrooms this time and they were delish, and will be a chili staple in the future. It has had carrots, but they weren’t a fav so don’t go there unless you feel passionately about carrots. I freely change amounts depending on how many I plan to feed: more than just my fam means another can or two of beans; a crowd means adding more fresh chopped veggies, beans, and tomatoes. Upping the quantity necessarily means upping the spices (but I always start conservative and add flavor as I go; you don’t want to get too spicy and fry kids’ mouths – you can always serve sriracha on the side). So here’s what I did, and you can try your hand at winging a pot o’ veggie goodness. In a large soup pot over high heat, saute onion until browned; if necessary, add a teaspoon of water at a time to avoid sticking. Add bell pepper, zucchini, mushrooms, and garlic, along with a small amount of water (1/4-1/2c, depending on veggie volume). Cover and cook down slightly, stirring every few minutes. Add tomatoes, beans, and seasonings. Chili may look dry but veggies will cook down and release additional liquid. Cover and reduce heat to medium. Continue cooking, stirring occasionally, for 10 or so minutes; add corn and cook until heated. Adjust seasonings as needed. Serve with corn chips or corn bread, or over cooked brown rice, french fries, baked potatoes, or spaghetti. This chili is versatile! And, BTW, did you notice? No oil, no salt? Nothing bad for you in this one! 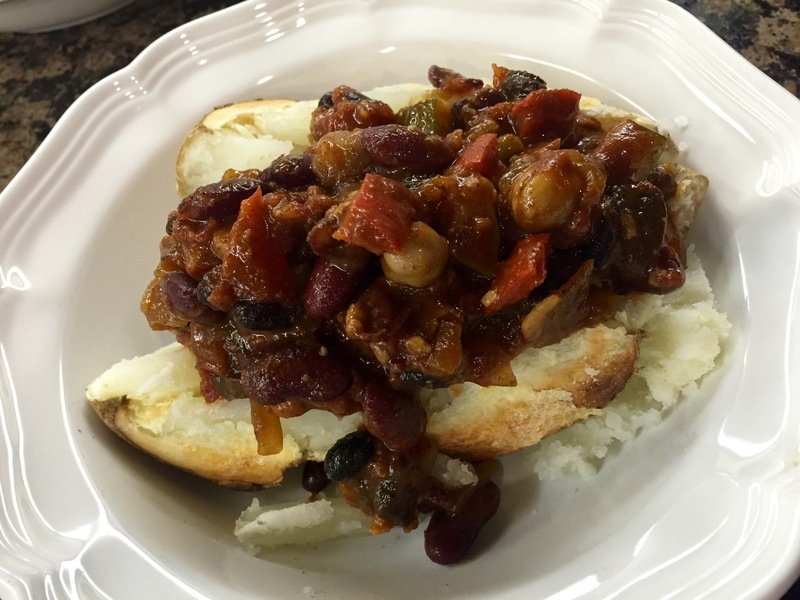 This entry was posted in cooking and tagged chili, comfort food, costume party, Halloween, parenting, parenting teens, party, veggie chili by Milagro Mama. Bookmark the permalink.